The Verdict: A number of the elements of this Parma just weren’t very good. Dry chicken, too little of the sauce, ham and cheese and uncooked chips all made this an underwhelming meal. How underwhelming? My favourite bit was the salad. Enough said! Chicken: A quite small piece of chicken that was over cooked to the point where the chicken was quite dry and the outer casing of crumbs was burnt in places. Tomato Sauce: Whilst the tomato sauce was quite nice the shame of it was that there just was not enough. It did not cover the chicken piece and did not cut through the dryness of the chicken. Ham: Really a case of repeat the above and replace the words “tomato sauce” with the word “ham”. Nice, but not enough! Cheese: The menu speaks of 3 cheeses in this dish however I had no way of verifying that. What came out with this meal was well melted and tasted great. Again though: there was not enough of it. Side dishes: The Lord Stanley Parma side dishes presented two ends of the spectrum this week. The salad was the hero of the dish: it was small but all of the elements were well put together and it was well dressed. The chips where undercooked and soggy in places. Presentation: The salad was presented in a small bowl on the plate. Whilst I like this idea it meant that a lot of space on a large plate was taken up and, of course, the chicken piece ended up on top of the chips. The Venue: The Lord Stanley Hotel is in East Brisbane. It is a very large hotel, much larger than I recalled to be honest, with a bistro, TAB and gaming facilities as well a lot of onsite parking. My chicken Parma cost $19.90. The final word: Not for the first time on this blog I will quote Homer Simpson and say “you don’t make friends with salad” because whilst the salad was the hero of this meal the rest of left me feeling somewhat underwhelmed. 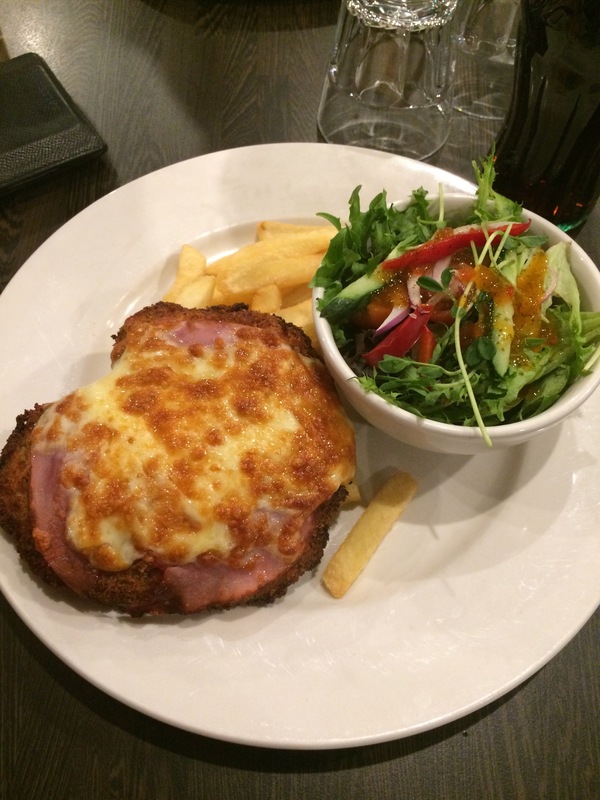 This entry was posted in Uncategorized and tagged Brisbane, brisbane's best, chicken parmigiana, Lord Stanley Hotel. Bookmark the permalink. Thought that the Lord Stanley would do better than that. Quite a few people have a meal at this venue on their way to or from the AFL Football at the Gabba, and have given good reports on the food. By the way – there is no ‘h’ in were.